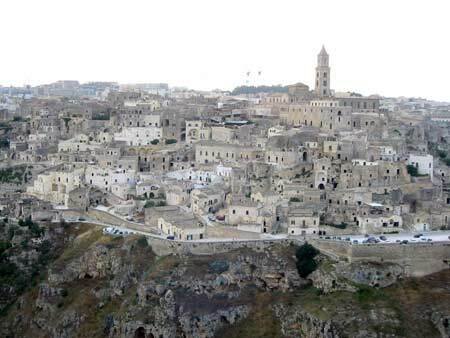 I was thinking about “Long Now” and “housing” and I found a page on wikipedia on the very ancient town of Matera with her multimillenial heart. In Italian we call this place “Sassi di Matera” (the Stones of Matera). For the last 9000 years people lived in this area. Objects nfrom the Paleolitic age was found in the caves that form the core of the town. And thousands of these caves have been converted into houses and used and re-used for centuries and centuries. The place has known periods of abandon and repopulation following the ups and downs of demography and local economy, but there is still people that, quoting the English Fodor’s Guide, “can boast to be still living in the same houses of their ancestors of 9,000 years ago”. The local authorities with UNESCO and foreign partners are working to revive the area. There are many things to learn from this site: it is so interesting to see, in this poor and simple multimillenial neighborhood, how they managed water or they oriented of the main door of the house to take advantage of the sunlight.